Lacrosse photographs is a section that I personally am very passionate and excited about. This site is about sharing lacrosse with the masses. It's about showing the rest of the sports world what the people and spirit of this sport really are all about. Who you are. This section gives you an opportunity to share the beauty of this game with each other, and with those who are totally new to the sport. Lacrosse is magical to watch, and to play. But, I wanted a place where we can share our special pictures and moments with each other. I am not just looking for photos. I really want your stories too. It is so important to understand what this is all about. Why this sport is so special, and what it means to your family. Why should someone want to get involved? What is so special about this very tight knit, and loyal group. I am looking for your help. Our very own growing Lacrosse community! 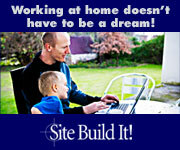 Pictures, Video, Profiles, Groups, Forums , Applications, Events, Business Listings, and so much more!!! Come check it out. Share your action and game shots! Team portraits or group pictures! 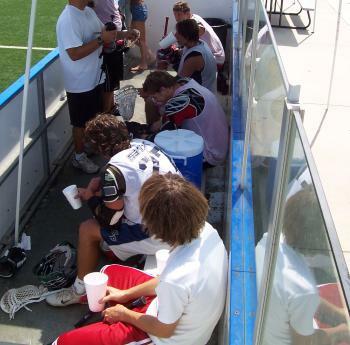 To show you what I mean I have added this photo of my son Brian's summer box lacrosse league. It was mid July in San Diego County and it was a very hot summer day. I mean we are talking temperatures over 100 degrees. But this sport is so special that these Stickbrain damaged kids were out on that HOT turf playing recreational box lacrosse on a Saturday. I mean most of their friends were at the beach that day. And I certainly would have preferred to be at the beach. I mean this is at a typically very busy sports park, and it was so hot that day that not even a softball game was going on. We were the only ones there that day. And they played from 9:00 in the morning until well after 12:00 PM for the shear joy of playing. There were supposed to be alternating games, every hour, but it was so hot and the shifts needed to be short, so guys just kept filling in from other teams, and the game just kept going on. Guys would sit out a little while and get some shade and water and when they were ready they would jump back in on the next shift. Most of the kids in this picture played the whole three hours. It was really special to watch these kids play for the shear enjoyment of the game under what most, including I, would consider brutal conditions. 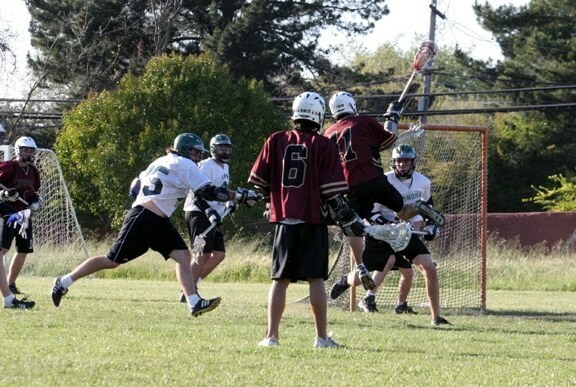 This is one example of the kind of Lacrosse photographs I am looking for. What is happening in your lacrosse world? What makes this sport so special for you and/or your kids? Are you a player, maybe you have a great action shot you want to share. I don't care what it is, submit it, and as long as it is appropriate for the site we will post it. I don't care if you write a sentence, a paragraph, or a page, what ever you are moved to share. Or maybe you just want see what's been posted or leave a comment and rate it. The first SimplyLacrosse.com photo contest is now in the books. We had entries in two classes. 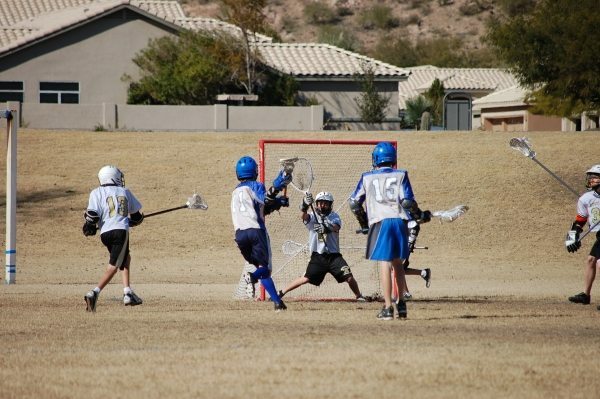 The following Photo is the winner of the Youth category and was submitted by Rob Miller of Ahwatukee lacrosse which is part of the AYLL JHS league. A note from Rob - "We have so many kids (we are no-cut) that we field two teams, the Lightning and the Storm. This year the Lightning is the "A" team and has the more experienced kids while the Storm is the "B" team and is mainly new players. We also have a team called the Dragons for 5th grade and under. Our high school team is the Desert Vista Thunder. All of the teams work together and many parents are involved at all levels. My son is the goalie on the Lightning and this is his third year playing. 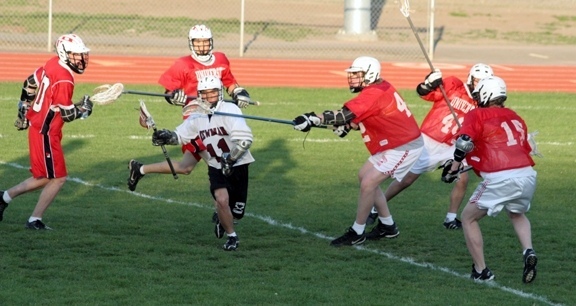 We knew nothing about lacrosse until our son declared he wanted to play. It has been a great experience so far. Best team sport I have seen. Wish I played when I was young." We just loved this photo because it epitomizes Lacrosse. Here a kid a clear foot and a half shorter defends a much larger player. 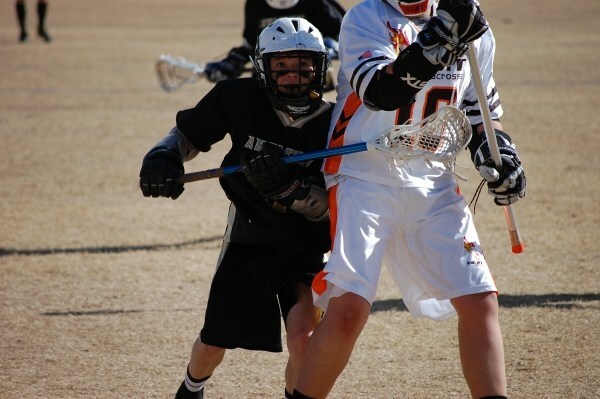 Lacrosse is about all size athletes competing and it is one of the things that make it so fun. Everyone has an opportunity to play and play well. The second place youth photo was also submitted by Rob Miller. Thank You Rob for your submissions. The winner of the high school photo contest is Kathryn Koh representing Cardinal Newman Lacrosse in California. For the same reason we picked the winner of the youth category we loved this photo of the single small man surrounded by defenders showing good technique as he works to free himself. The second place youth photo was also submitted by Kathryn Koh. Thank You Kathryn for your submissions. I am very grateful to you both for your submissions. Thank you for participating. I am looking for more submissions in the next contest and I would love to see some college and women's photos. So please get your photos in. It is easy and fun. I am also looking for lacrosse photographs from all of you amateur, aspiring, or accomplished photographers who love this sport too. This is the place to go to share your cool Lax pictures, or share a photo of your team, or your child. My vision is to build out sections of different categories of photographs. Take part in our latest photo contests! Photo contests are a regular part of this site. Make sure you enter and perhaps one of your lacrosse photographs will win!